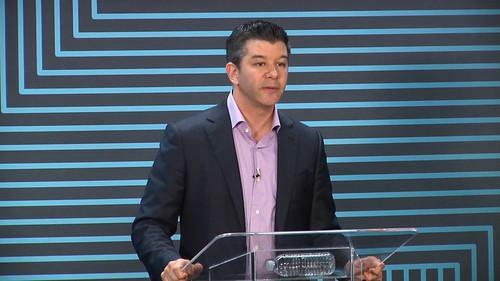 Travis Kalanick, CEO of Uber, speaks at an event in San Francisco on June 3, 2015 held to mark the fifth anniversary of the ride hailing service. Uber Technologies is suspending its UberPop service in France, after a bitter fight with taxi drivers who say the service breaks the law. The company plans to remove access to UberPop from its mobile app in France from 8 p.m. local time Friday, it said in a blog post. UberPop allows passengers to hail rides from unlicensed drivers and is similar to the Uber X service offered in the United States and other countries. Uber has been disrupting transportation markets around the world -- nowhere more so than in Paris, where taxi drivers recently blocked highways and airport entrances with burning tires in protest at the company's behavior. The protests also reportedly included attacks on Uber drivers, their vehicles and passengers. The taxi drivers are angry because, they say, UberPop breaches a new law on hiring vehicles with a driver that entered effect on Jan. 1. Uber has been carrying on regardless, but now says it will suspend the service and wait for the Constitutional Court to determine the validity of the new law in a ruling expected by Sept. 30. It made the move to calm the debate, it said, and because it did not want its drivers or passengers to take any risks. The suspension comes despite the acquittal, last month, of an Uber driver charged under the new law following a wave of police checks on vehicles in recent months. The company said the court in Lille found that UberPop did not constitute an illegal taxi service as defined by the law. On Monday, two senior Uber executives were arrested on suspicion of inciting people to work without paying the necessary social security charges on their income, according to local media reports.